My spiritual journey began 24 years ago. Due to my grand parents and great grandparents from both sides of my family, I was introduced to Espiritismo, and this is how my journey into various spiritual paths began. I am Omo Oshun and Oriate Olu Osain in the Lukumi/Yoruba tradition. First off, I was first baptized in Espiritismo, Sance, 21 Division, and then received Santo Lavao. Afterwards, I got initiated in to the Palo Mayombe tradition and was crowned in Osha. I later received Osain, and the ceremony of Irete Kutan. 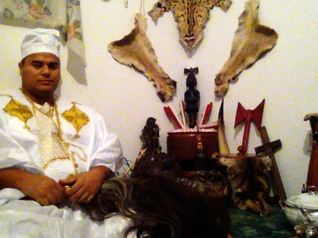 In this ceremony, you receive Igba OSHA which gives you the title and rank of Oriate, which is the highest rank within the Olorishas. As a child, I saw spirits and paranormal activities and these experiences caught my attention. I wanted to learn more and continue exploring these paths. I want to share this beautiful traditions to show you that, when practiced correctly, the results are life changing. I am passionate about teaching these spiritual truths because a lot of people that have faith and a true love of these traditions, but there are a lot of "so called" priests doing bogus initiations, taking advantage of people's faith. Due to this misrepresentation, the true essence of these traditions are fading away, and I refuse to see this happen. As an initiated priest, I feel is my job keep these traditions alive. Through this traditions, you can do spiritual work. We do different kinds of divination readings, cleanings, ceremonies. We also use different kinds of divination tools for different situations and to find a solution. We also expel evil entities, witchcraft, dark spirits, spiritual initiations, work and more.